The European Student Earth Orbiter satellite (ESEO), which contains a vital payload designed and built by students from the University of Surrey, was launched into space on Monday, December 3, 2018 by the SpaceX Falcon 9 rocket from Vandenberg Air Force Base in California, USA, as one of Spaceflight's SSO-A mission payloads. 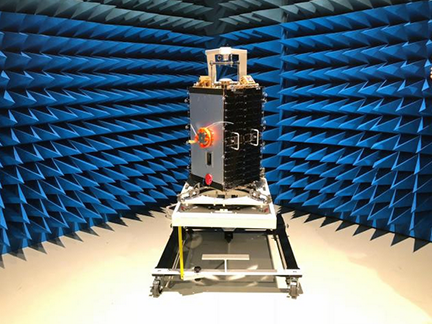 The ESEO satellite in the anechoic chamber at the ESTEC test facilities, in the Netherlands. Image is courtesy of AMSAT-UK. ESEO is part of a European Space Agency project that aims to prepare the European space workforce of tomorrow — with University of Surrey students getting the kind of hands-on, real life space engineering experience — through access to the Surrey Space Centre — that students elsewhere simply cannot receive. The radio and computing payload was designed and built by undergraduate and postgraduate students at the Surrey Space Centre and was achieved without central ESA funding. The joint Surrey and AMSAT-UK payload transmits key information to the ground — such as vital power, temperature and speed — and is designed to use very low energy, allowing it to remain in a permanently on state. This allows members of the public to track the satellite with low tech equipment such as a direct amateur radio connection to the satellite’s internal data. This mission is already part of history as it was the first time a rocket, the Space X Falcon 9, has been used on three launch missions. Dr. Chris Bridges, project lead and Senior Lecturer in On-Board Data Handling at the University of Surrey, said that at the Surrey Space Centre, all are accustomed to building and launching small satellites that have been engineered by seasoned experts and professionals. This project is unique as it has been achieved on a shoe string budget and completely led by students. This is the culmination of several final year students working to create something that will be flown in space. Students simply don’t get this type of experience elsewhere — here at the University of Surrey, their skills are honed on real industrial missions.